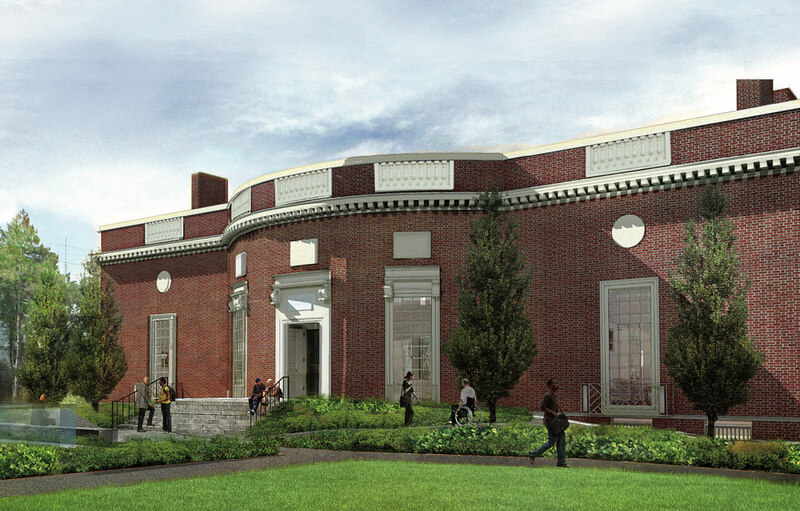 Two years after commemorating its seventy-fifth anniversary, Houghton Library will have something else to celebrate before its eightieth: the largest renovation project in its history. Though a plan to revamp the library—Harvard’s principal repository for rare books and manuscripts (see “An ‘Enchanted Place,’” March-April 2017, page 36, on the anniversary exhibition)—has long been simmering, the project’s timing was spurred by a donation of both books and money from Peter J. Solomon ’60, M.B.A. ’63, chairman and founder of the eponymous investment-banking firm. The proposed construction centers around the idea of accessibility, both literally and figuratively. Solomon and Thomas Hyry, Fearrington librarian of Houghton Library, hope the changes will draw more people into a space that often feels underused. When deciding where to donate his collection of children’s literature, manuscripts, and illustrations, he considered Princeton’s Costen Children’s Library, the Morgan Library & Museum, and the Metropolitan Museum of Art—but as a former Harvard Overseer, he always suspected the collection would end up in Houghton. In 2017 he committed to donating it, but with a caveat: that Harvard make some changes to open Houghton up to more people. Solomon said Houghton sits on “prime real estate,” but often doesn’t seem like it. Houghton’s brick façade will not change, but the landscape directly in front will undergo a facelift. When researching the building, Ann Beha Architects noticed that the original drawings of Houghton’s entry differed from what was actually built. This, Ann Beha said, gave them the feeling that they could re-develop the area. Where there’s now a small staircase and podium—typical of Georgian architecture—her firm has designed a fully accessible entrance with softly graded symmetrical walkways that meet at the entry door. The plans also include a small gathering place in front of the library and a central staircase. An aerial view shows the redesigned walkways and new landscaping in front of the library, giving Houghton more presence within the Yard. Houghton’s interior spiral staircase will remain the same, but the building gains a new elevator, its first for non-staff use. Anne-Marie Eze, director of scholarly and public programs, said librarians expected that finding space for a new elevator would be tough. It turned out, happily, that an elevator shaft was part of the original pre-World War II design, making installation surprisingly easy. Future visitors will also notice a new security system. Now, a guard sits at a desk in the lobby, responsible for welcoming and orienting guests and ensuring that the collections stay safe—a combination of duties Hyry acknowledges is not ideal. In the new plan, visitors will be greeted by a designated staff member—a new position—and will interact with security only on their way out, through a separate exit door. Outside the lobby, perhaps the biggest change will come to the reading room—the only place researchers can spend time with items from the collection. Staff sit toward the front of the room, monitoring it and assisting researchers. But as it stands, it’s a little too one-size-fits-all. The new plan breaks the room into three sections, allowing groups to work together without disturbing those who would prefer to do their research in silence. Staff will continue to monitor and work with guests, but there will be a separate sound-proof entry and help-desk area. A floor below all this, Houghton’s bathrooms will be expanded and made code-compliant. Its stacks, located in the basement and sub-basement, will have to be re-arranged during the construction (those under the bathrooms in particular), with all books carefully tracked and moved. When Keyes Dewitt Metcalf arrived as director of the Harvard University Library and librarian of the Harvard College Library in September 1937, he quickly realized three things about the University’s collections: they were vast, varied, and not particularly well-preserved. Widener (completed in 1915) lacked air conditioning. This created a sticky situation—sometimes literally—for the rare books housed within. Librarians struggled to keep their collections protected from the dry heat of the winter, humidity of the summer, and increasingly pervasive pollution from the city. Within months of his appointment, Metcalf put three proposals in front of the Harvard Corporation. The first was for a separate rare-book library, connected to Widener by tunnel. The second was for an adjacent library for undergraduates. The third was for a storage facility to be shared with other libraries. The three plans were quickly approved, and aided by a donation from Arthur A. Houghton Jr. ’29—himself a book collector. Houghton and Lamont arrived in short order; the depository didn’t come along until 1986. The torrid pace of plan approval and funding was matched by the pace of designing and engineering. Houghton chose William G. Perry, most famous for his meticulous restoration of Colonial Williamsburg, as the chief architect. Construction got under way almost immediately, which proved a major blessing: the library was completed shortly before the attack on Pearl Harbor. “Houghton Library was built at about the last moment in which it was possible to do such work,” wrote Bainbridge Bunting, Ph.D. ’52, in Harvard: An Architectural History. “A few months later shortages of materials occasioned by the war would have made construction impossible; after the war the cost of materials and labor would have precluded such an undertaking for financial reasons alone.” Lamont Library, completed just after the war, shows how big an architectural difference a half-decade could make. This “home industry” aspect of the move into the new library and the preparations for its dedication, necessitated by budgetary limitations on the size of the staff, placed considerable burdens on those involved. At the same time it created a sense of involvement and the espirit de corps that have pervaded the Houghton Library during most of its history. “It’s definitely all hands on deck,” Eze added. In an ideal world, the library wouldn’t have to close at all, but the scope of the renovation all but necessitates shutting the building for a year, beginning in September 2019. For Hyry and Solomon, though, the wait will be worth it. Houghton is already planning for many more visitors after the renovation is complete, and Solomon said he’s received emails from alumni expressing enthusiasm about the project and the future of the library.